After the warmth of the last two months we finally experienced some cooler temperatures. Overall, November was about half a degree cooler than average, but still within the average range (the last time we saw a month that was in the below average range was April 2016). However, if you take a look at the temperature graph you can see that the 10th and 11th really stand out as abnormally cold days. 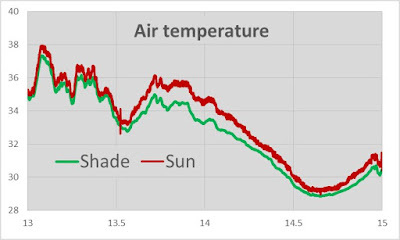 The temperature went down suddenly for about 36 hours and then just as suddenly came back up. In fact, if you took out those two days the month would have ended up being a bit above average. 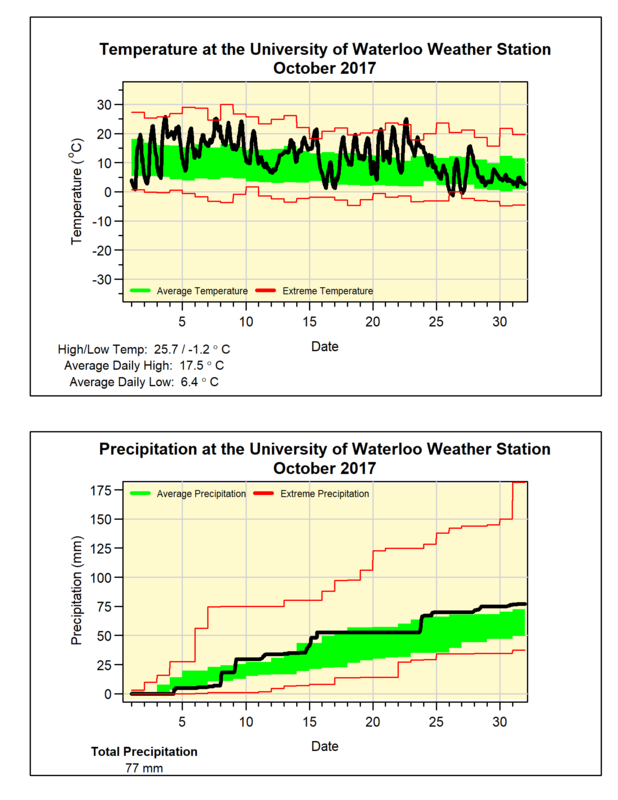 Although the 66.2 mm of precipitation was well below the average of 87.1 mm this was just enough to put November into the average range. So going into the final month of the year the total precipitation for the year is 956.6 mm which is above the average of 832.9 mm. This also means that we are already above the average for the year of 916.3 mm, and would only need an average December to end up above average for 2017. Most of October was really warm and if it wasn’t for the cooler temperatures in the last week it might have been one for the record books. As it was, the overall temperature was over 3.5 degrees above average making it the second warmest in almost 50 years (it was 5 degrees warmer than average in 2007). 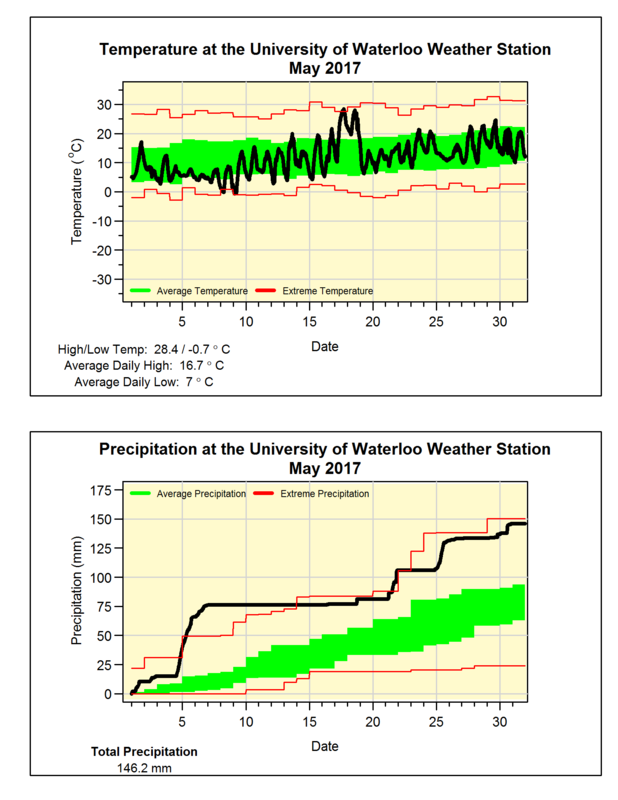 We also saw 12 days in October where the temperature was over 20°C, we haven’t seen than many since October 1971. 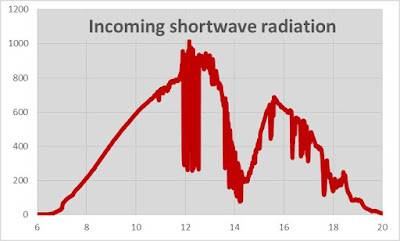 But the most significant day was the 22nd when the temperature topped out at 25°C, this was tied with 1947 as the latest day of the year with a temperature above 25°C in the over 100 years of weather records in the region (just for the record it got up to 25.6°C that day in 1947). 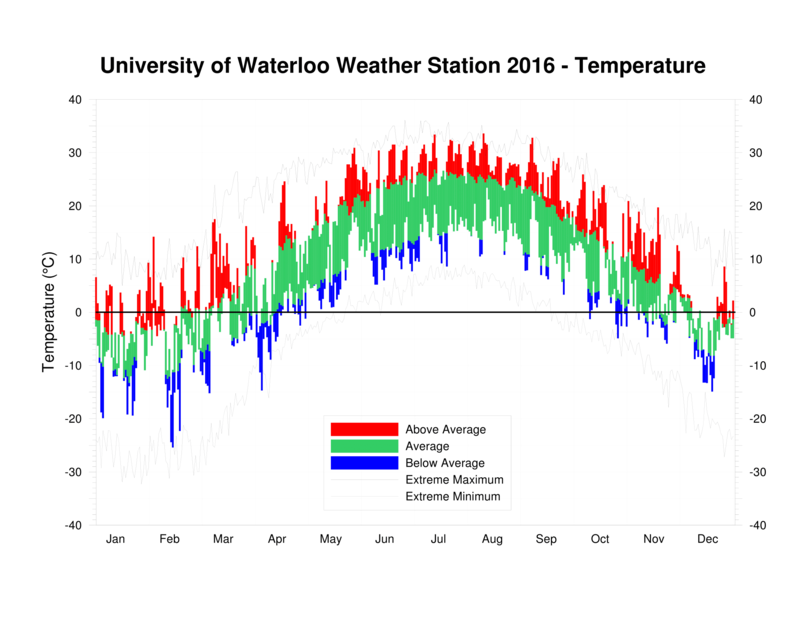 As we have seen in each of the 20 years of weather data at the UW Weather Station, the first day that it went below zero occurred in October. This year it first happened on the morning of October 26th, which is later than the recent average of the 13th. The resulting length of the frost-free season was 170 days, a little longer than the recent average of 160 days. 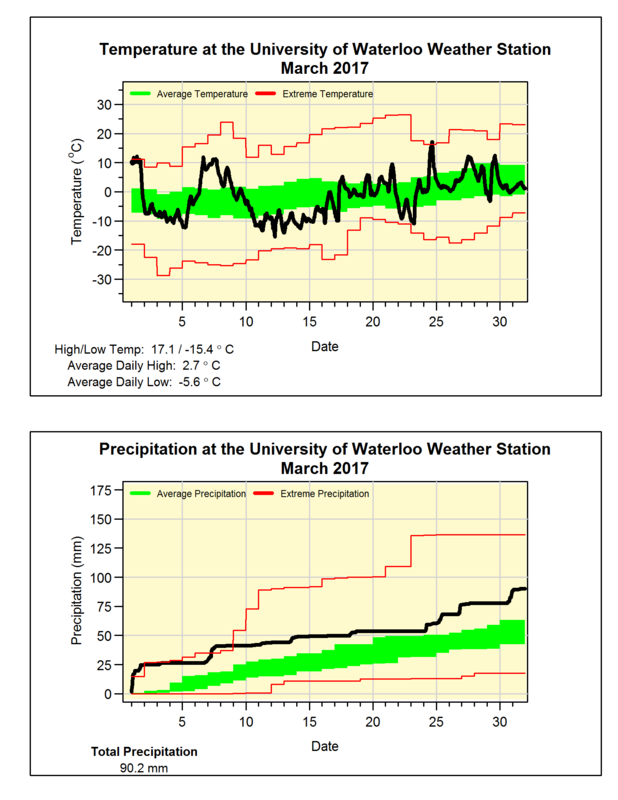 The 77.0 mm of precipitation was just enough above the average of 67.4 mm to put the month in the above average range. 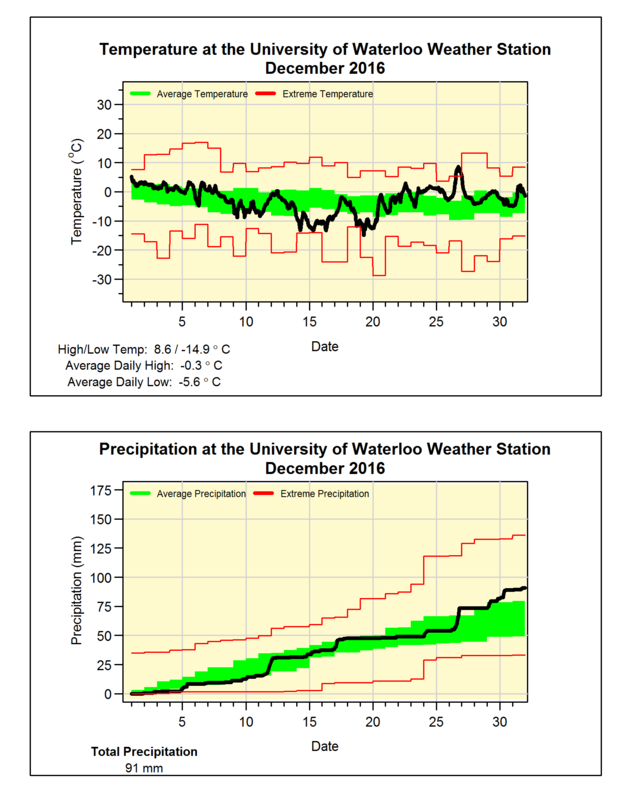 The total precipitation for the year is 890.4 mm is still well above the average of 750.6 mm. Well that was quite an end to September with the longest heat wave of the “summer” and some historical temperatures. 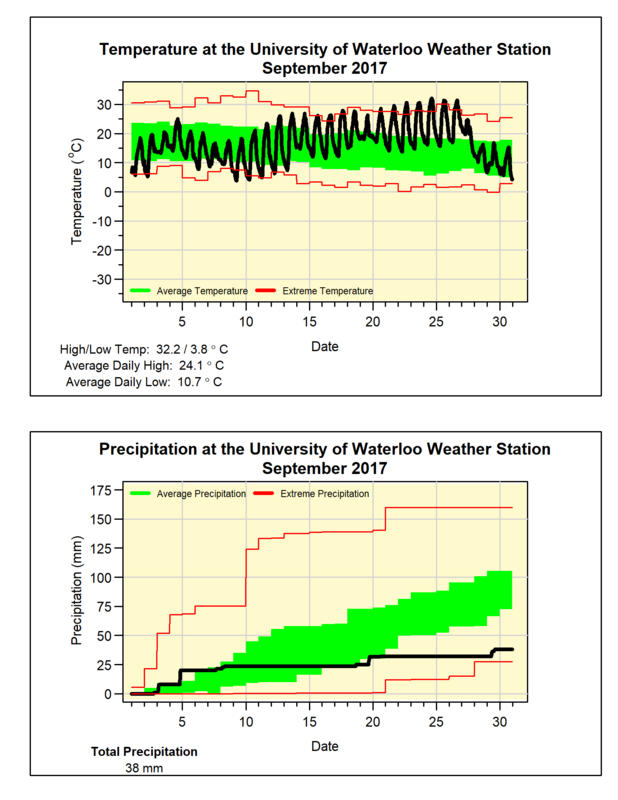 The most significant streak was the 15 days above 25°C between the 12th and the 26th, that is something we have never seen before in September during the 100+ years of weather records in the region (the previous record was 13 such days back in 1947). Some other notable events were the 5 days in a row above 30°C, which is something we have only seen a few times, the last was back in 1952. Finally, the high temperature on the 24th of 32.2°C was the highest seen that late in the year since September 24, 1931 when it was 32.8°C. Not surprisingly, the overall temperature was almost 3 degrees above average, what might be surprising is that this is colder than the last 2 years although they didn’t have the extreme highs we saw this year. It is also useful to remember that this year the month started off cool during the first week. But since I have you here can we talk a bit about recent Septembers? Fun fact: no other month has seen more consistently above average temperatures. In the past 20 years of data at the UW weather station, there has not been one in the below average range and only once was it even slightly below average (by 0.1 degrees in 2006). The month was also very dry with only 38.0 mm of precipitation compared to the average of 87.8 mm, with half of the total coming during the first 4 days. This dry month puts the total precipitation for the year at 813.4 mm, which is still well above, but a bit closer to the average of 683.5 mm than it was at the end of August. Although we didn’t see lots of really hot temperatures this month (only one day above 30°C), we also didn’t see lots of cold ones. This resulted in the overall temperature being just 0.2 degrees below average, but this is still within the average range. This may be surprising to some, but the fact is we have seen a string of warm months of August in recent years with this year’s overall temperature being the coolest since 2008. In the 20 years of data at the UW Weather Station, only one August (2004) was cold enough to be in the below average range. It was also a lot cooler than last year when we had 8 days over 30°C in August. 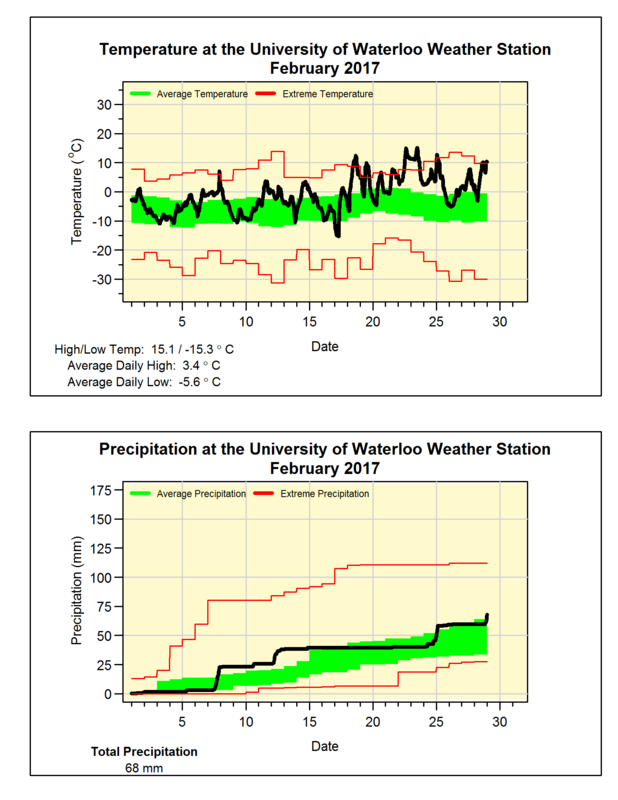 The month started out very wet, but with drier conditions in the last week the total precipitation of 93.6 mm was within the average range coming in a bit higher than the average for August of 83.9 mm. The total precipitation for the year of 775.4 mm is well above the average of 596.0 mm. For the last few months we have been in second in the “wettest year to date” category, however, there were lots of wet months of August in the past so we have dropped down to the sixth wettest year so far since records in the area began just over 100 years ago. In what should not be a surprise to anyone, it was the warmest February that we have experienced in the 100+ years of records in the region. The first half of the month saw temperatures that oscillated both above and below zero, but it was not until the 18th that the crazy heat came in. The month ended with 12 days where the high temperature was over zero including some days that were over 15 degrees above the average. Overall the temperature was 4.4 degrees above average which was almost half a degree more than the previous warmest February back in 1998. 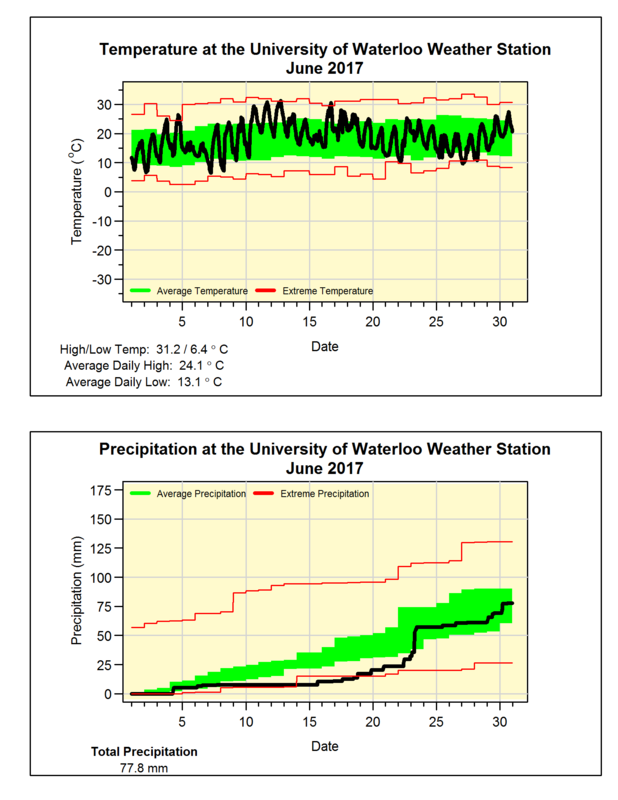 The high of 15.1°C on the 23rd was the highest February temperature we have ever seen in the region, in second place was the 15.0°C which happened the day before. 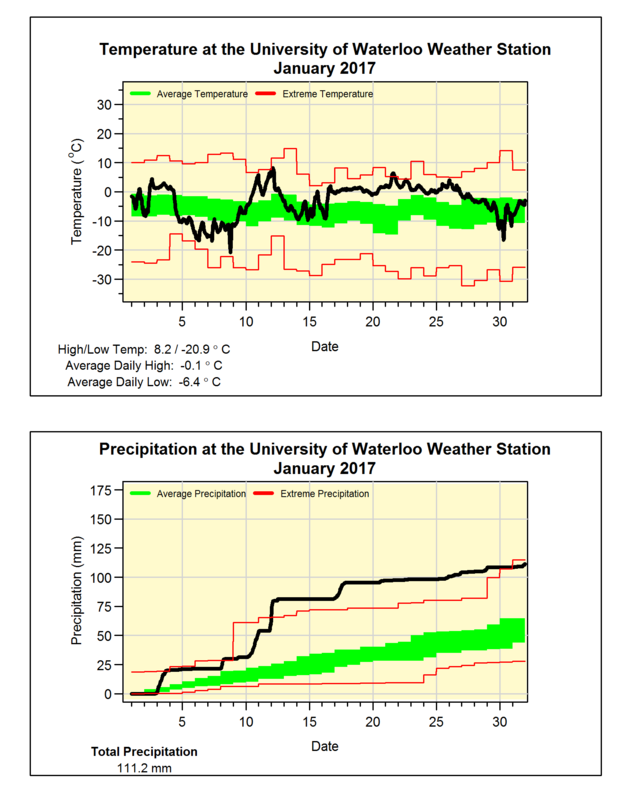 The precipitation total was 68.0 mm, just enough to put it into the above average range. Given the high temperatures, it is not surprising that we got about half the average amount of snow during the month (17.5 cm compared to 30.3 cm). Even though the last 2 months have only seen half the average snowfall, the snowy December means that that the total snowfall of 113 cm is only a little less than the 125.6 cm we would expect at this point in the snowfall season. 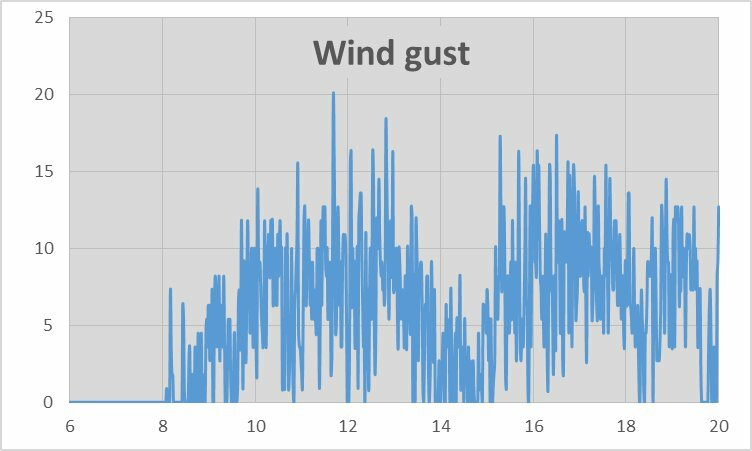 2017 Weather Station Contest is on! 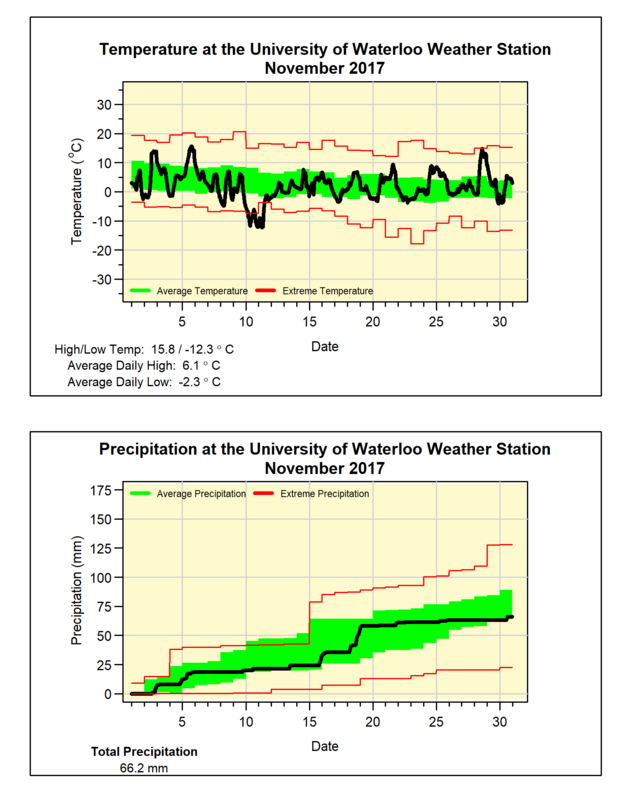 The 2017 edition of the UW weather station contest is now on! Can you guess for the first time the first time the weather station will record a temperature of 20C? Don't delay - you have to enter the contest by Wednesday, March 8th, 2017 at 2:00 pm. As of January 22nd we have had 8 days in a row of days with above zero temperatures and the current forecast is for 4 more. If we get to 12 days it will be longest streak of above zero days since we had 13 back in 1944 from Jan 19 to 31. Note that this only counts days in January, for instance 2007 started with 8 days above zero, but this was after 23 to end off 2006, so the total streak there was 31 days, just not all in January. Considering that April was the only colder than average month during the year, it is not that surprising that 2016 came in as one of the warmest we have seen in the 100 years of weather records in the region. Overall the average temperature was 8.69ºC putting it behind only 2012 and 1998. 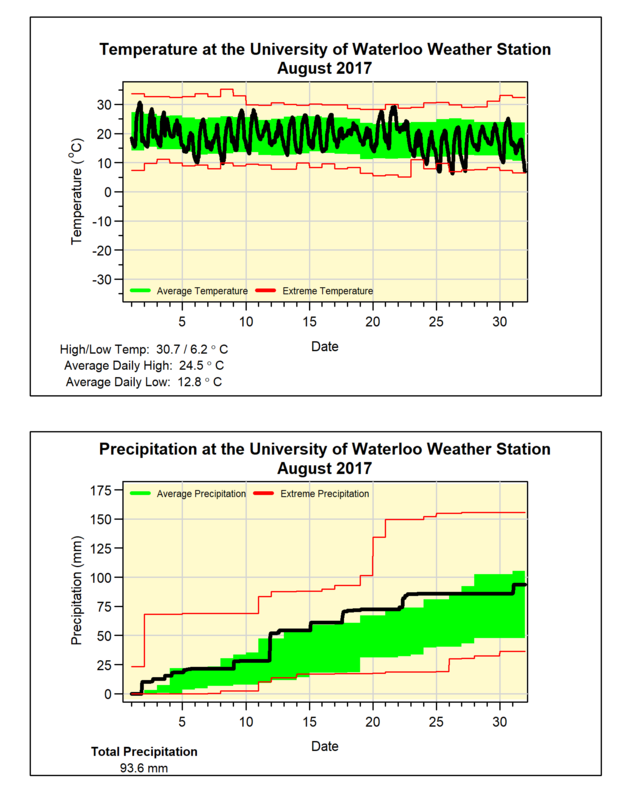 The year started off in the middle of the very warm winter of 2015-16 resulting in the first 3 months being all warmer than average, this included a high temperature of 14.2ºC on the third of February which was the highest February temperature we have seen in the region. Things turned around in April with the only colder than average month of the year that was also the fourth coldest April in the region’s weather records. The warm end of the Spring in May transitioned into the hottest summer we have had since 1955 and the third highest overall. 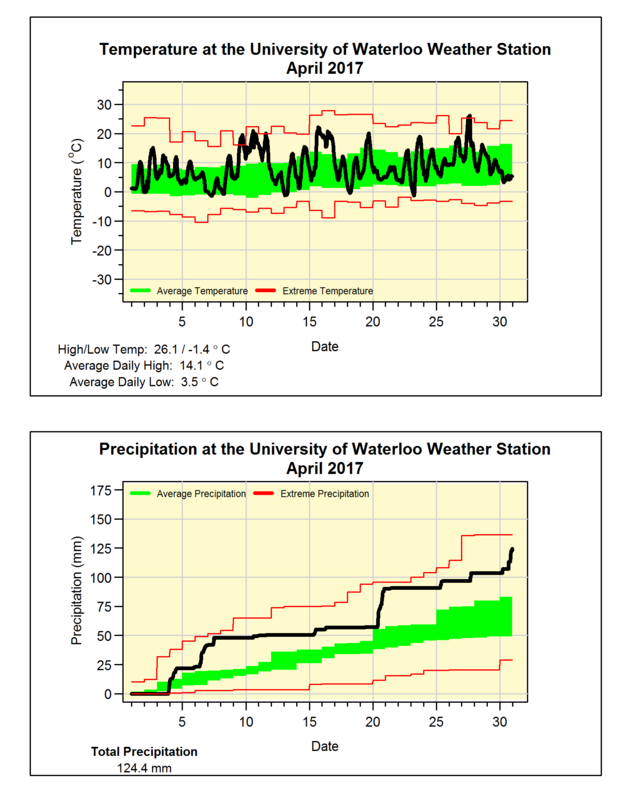 The 19 days above 30ºC during the summer contributed to the 27 we had in total for year, this is much more than the average of 8, but much less than the 49 we saw in 1955. This then continued into the fall with September to November all coming in at over 2.5 degrees higher than average including: September being the warmest since 1959 and the fifth hottest overall and November the sixth warmest and the most days over 10ºC at 20. But as we have seen a lot of warm Fall seasons lately, this Fall wasn’t that significant even these really warm temperatures. 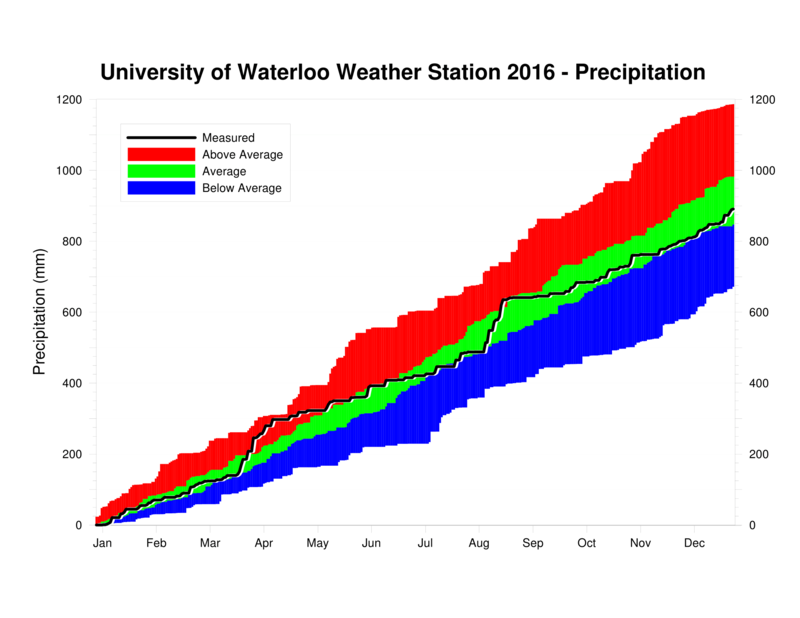 As often happens there were wet and dry months during the year, for 2016 the year started with a few average months for precipitation. Then March came in over twice as wet than average, but this quickly changed as for the most part it was a very dry summer. It would have been historically dry if not for a 10 day period in August when almost 150 mm fell, this resulted in August being the 7th wettest all time. For the rest of the year we saw pretty much average precipitation which helped in putting the final total within the average range. The final total came in within the average range at 891.0 mm, which is a little below the average of 916.3 mm. As for snowfall, we saw 100.5 cm of snow since the beginning of January, which is about average for that time of year. But the 75.5 cm in the second half of the year (mostly from December which saw almost twice the average for the month) put the total for 2016 of 176.0 cm which is above the annual average of 159.7 cm. So the final story of 2016 is the overall heat during the year and how dry it was during most of the summer. But there wasn’t a whole lot in terms of extreme events, in fact in the list of extremes that are listed on the next page there was not one that was exceeding during this past year (of course this will get harder as more data is added to the record, but usually we have seen at least one or two extremes every year). 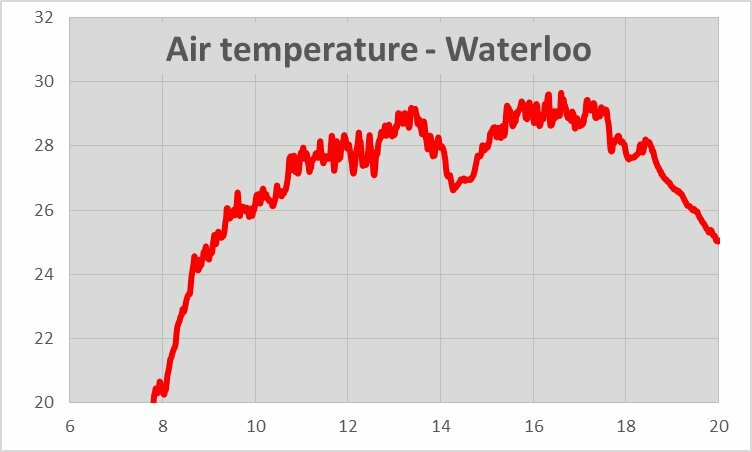 There was a much colder than average week in the middle of December that was offset by a warmer start and finish to the month, resulting in an overall temperature of 0.3 degrees above average. This put the month within the average range for only the second time this year compared to 1 below average month and 9 above. The precipitation was nicely within the average range for most of the month, but a few storms in the last week (including the rain on Boxing Day) resulted in the total finishing above average. The total of 91.0 mm was well above the average of 71.2 mm. With a total snowfall of 73 cm, it was the snowiest since 2008 (when we had 95.5 cm) and almost double the average of 37.2 cm.